Samsung to come up with quad-core processor tablet in place of dual-core processor, as rumor cited through a Korean Samsung insider. Samsung Galaxy Tab 2 (10.1) which was supposed to be released on May has to be delayed as Samsung is likely to upgrade the device with a quad-core processor. As rumors are to be believed, the production of upcoming Galaxy Tab 2 (10.1) with a dual-core processor has been put on hold for the upgradation. 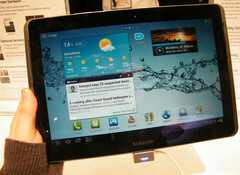 The new Galaxy Tab 2 may come up with quad-core processor Exynos chipset, may be the 32nm Exynos 4412 chip and a quad core GPU. This could be the first tablet by Samsung with all these features. But all good things come with a price. So it is very likely that the upgraded model will have an impact on the pricing of the 10” tablet. It was reported that the previous model would have been around $400 for a 16GB storage model. This also means that the release date of the product will be pushed back further. The quad-core Galaxy Tab might come into the US market in the next few months and after all the speculations; its development will be watched closely. We will now have to wait and watch if the new quad-core Galaxy Tab 2 will take over the market from its competitors Google/ASUS tablet and Transformer prime.